We will be live blogging today's Army-Navy game at Lincoln Financial Field in Philadelphia. Navy (9-2) comes into today's game against Army (2-9) as a heavy favorite. History tells us to throw the records out the window when these two teams play each other. 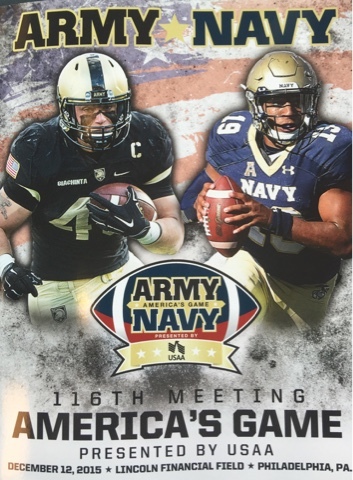 Although the Midshipmen have won fourteen straight against the Black Knights, expect a competitive game this afternoon in the 116th meeting between these two service academies. 6:28 - Navy with an INT at the goal line. 6:27 - Army with a pass into Navy territory. 6:26 - Navy punts for the 10th time. Army ball on their own 20. 6:18 - Lorentez Barber picks off the Army pass and Navy has the ball at the Army 35 with 3:27 left in the game. 6:16 - Navy's punt goes into the end zone and it's Army's ball with 3:36 left in the game. 6:13 - Navy has a fourth down and six on the Army 40 yard line. Navy runs the play clock down to 0 and calls a time out. With 3:43 left in the game, Navy holds on to a 4 point lead. 6:09 - Reynolds completes a pass to Demond Brown for a Navy first down. 6:05 - Army fumbles and Navy's Ted Colburn recovers at the Navy 34. 8:33 left in the game and Navy leads by 4. 6:04 - Carter completes a 39 yard pass to DeAndre Bell. Army with a first down at the Navy 33. 6:00 - Navy is forced to punt for the eighth time tonight. Army takes over at their own 28. 5:53 - Army misses a 29-yard field goal wide left and Navy leads 21-17 with 12:19 left in the game. 5:46 - The third quarter ends with the score, Navy 21, Army 17. Army has the ball on the Navy 22, 3rd and 1. 5:42 - Carte completes a 30 yard pass to Poe to the Navy 49. Poe has 5 catches for 121 yards, both career highs for the Army junior. 5:41 - Navy will punt again also. The MVP may be a punter tonight. Army takes over at their own 21. 5:39 - Time for another Army punt following a Will Anthony sack. Navy fair catch at their own 36. 5:36 - Jamir Tillman has 5 catches for 102 yards. Reynolds now has 30 career TD passes, a school record. 5:34 - There's the big play - Keenan Reynolds completes a 50 yard TD pass to Jamir Tillman. Navy takes the lead, 21-17 with 5:51 left in the third quarter. 5:33 - Navy with a sack on third down forces an Army punt. Both defenses are playing very well tonight. One big play could decide this game. 5:30 - Navy has punted more times tonight (6) than they have in any game this season. They punted 5 times against Air Force. 5:27 - Army's defense is stout again forcing another 3-and-out for the Mids. Navy's punter, Alex Barta has punted 6 times in the game. His last punt traveled 66 yards. 5:22 - Navy's defense comes up big and forces Army to punt again. Navy will start on their own 29 yard line. Navy has only 20 carries in the game so far - Reynolds and Chris Swain each have nine carries. 5:19 - Today's attendance is 69, 722. 5:16 - Army forces a 3-and-out of their own and Navy punts from their own 37. Army fair catches at the Army 26 with 11:52 left in the third quarter. 5:11- Navy forces a 3-and-out and Army punts from their own 21. Navy calls a fair catch at the Navy 32. 5:08 - Army starts the second half on their 25 yard line. 5:00 - Army leads the time of possession in the first half - 17:26 to 12:34. The Black Knights also lead in total offense - 206-190. Neither team has turned the ball over in the half. Navy has punted 4 times to Army's 2. 4:55 - Chris Carter leads Army in rushing with 33 yards on 11 carries. Tyler Campbell has 31 yards rushing and a TD. Edgar Poe has 4 receptions and 91 yards receiving with a TD. Keenan Reynolds leads the Mids rushing attack with 114 yards on 9 carries and 2 TDs. Jamir Tillman has 4 receptions and 52 yards. Jeremy Timpf leads Army with 6 tackles and and Daniel Gonzaez has 6 tackles for Navy. 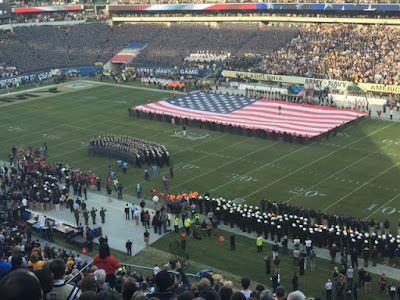 4:44 - It's halftime and Army leads Navy, 17-14 in a shocker. 4:43 - Navy's DE Amos Mason is shaken up on the play. Freshman Jarvis Polu is his backup. 4:41 - Navy's punt is downed inside the 1 yard line. Army takes over with 0:18 left in the half. 4:33 - Navy converts a fourth-and-one on the Army 49 when DeBrandon Sanders runs for three yards. Navy calls a timeout with 0:43 left in the half. 4:31 - Dishan Romine returns the kickoff 42 yards to the Navy 42. 4:27 - Chris Carter hits Edgar Poe for a 39-yard TD pass to give Army the lead again, 17-14 with 2:08 left in the half. The Black Knight drive lasted 40 seconds and covered 54 yards. This is the 5th lead change in today's game. 4:22 - Reynolds third down pass falls incomplete and Navy is forced to punt on a 3-and-out. Army returns the ball to the Army 46 with 2:48 remaining in the half. 4:20 - Navy fumbles on their first play of the drive and recover. Brings up a second and fourteen. 4:16 - Army faces a 4th and 11 on the Navy 37. The Black Knight's punt goes barely goes into the end zone and Navy takes over on their own 20 with 4:24 remaining in the half. 4:11 - Army's Freshman QB, Chris Carter is a good runner but takes some big hits. 4:00 - With that TD, Keenan Reynolds now has 7 TDs in an Army-Navy game which is a new record. He also now has 85 career TDs which is a Division I record - both FBS and FCS. 3:58 - Reynolds punches the ball into the end zone from 1 yard out and Navy regains the lead over Army, 14-10. Reynolds now has two rushing TDs in today's game. Navy's scoring drive was 7-50-3:27. 3:56 - Reynolds with a 35 yard run down to the Army 4 yard line. Reynolds now has 115 yards rushing on the afternoon. 3:51 - It's the end of the first quarter and Army leads Navy, 10-7. 3:49 - Army is forced to punt after a three-and-out from their own 10 yard line. The punt is fair caught at midfield for the Midshipmen. 3:46 - Navy punts for the second time in the game and downs the ball at Army's six yard line. 3:45 - Keenany Reynolds is now the first QB in Navy history to run and pass for 1000 yards in two seasons. 3:43 - Navy starts on their own 25 for the third consecutive drive. Reynolds completes a 35-yard pass to Jamir Tillman and Navy has the ball at the Army 40. 3:38 - Army's Tyler Campbell runs 29 yards down the Army sideline for a Black Knight TD. Army now leads 10-7 with 4:10 remaining in the quarter. Army's scoring drive was 7-82-3:43 capped off by Campbell's first career TD. The score was set up by a 13 yard pass to Poe followed by a 15 yard personal foul by Navy. 3:29 - Navy's Keenan Reynolds carries two times for 17 yards and 58 yards (TD) and Navy now leads Army, 7-3 with 7:58 left in the 1st quarter. Navy's scoring drive was 2 plays for 75 yards and took 33 seconds off the clock. That was Reynolds' 84th career TD which is an FBS record for most rushing-receiving TDs. 3:27 - Two kickoffs for Army and both have been downed in the end zone. 3:24 - Daniel Grochowski kicks a 31-yard field goal for Army. 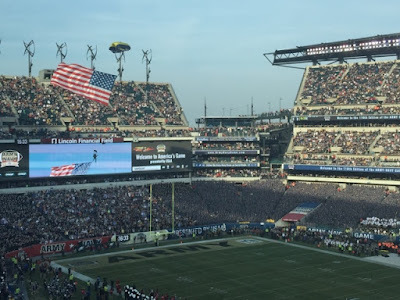 With 8:31 left in the 1st quarter, Army leads Navy, 3-0. 3:20 - An offensive penalty and an Army fumble makes a 3-20 for Army at midfield. Chris Carter completes a 31 yard pass to Poe for a first down at Navy's 19. 3:15 - Army forces a 4th and 5 on the Army 47 and Navy will punt. Edgar Poe returns the punt 50 yards to the Navy 40 yard line. 3:11 - The kickoff is downed in the end zone and Navy will star on their 25 yard line. 3:05 - The fly overs have taken place, Army has won the toss and it's game time. Navy will have the ball first. 3:01 - They just sang the National Anthem and displayed a huge American Flag on the field. 2:50 - The Navy Leap Frogs land perfectly on the Lincoln Financial Field. Army's Golden Knights are now in the air. 2:33 - Both teams are on the field going through their pre game warmups in preparation for this afternoon's game. You couldn't ask for better weather. It's 68 degrees and mostly cloudy with just 35 minutes till kickoff.